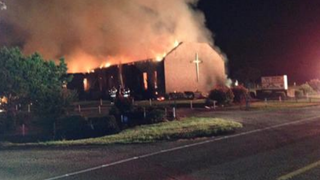 Mount Zion African Methodist Episcopal Church in Greeleyville, S.C., burned well into the evening June 30, 2015, as two fire crews from different counties battled to get the flames under control. There was reportedly no criminal intent behind the fire overnight Tuesday at a historic black church in Greeleyville, S.C. According to local investigators, along with the the federal Bureau of Alcohol, Tobacco and Firearms, the blaze at Mount Zion African Methodist Episcopal Church must have been sparked by “natural causes,” according to reporting by NBC News. The same church was burned to the ground 20 years ago by the Ku Klux Klan and is one of seven historic black churches across the South that have burned since the mass killings of nine parishioners at Emanuel AME Church in Charleston, S.C. The feds have found no links between the fires.